Helmets are decorated with decals, just like all helmets used ont he field, We even use the same materials, just a little thinner. 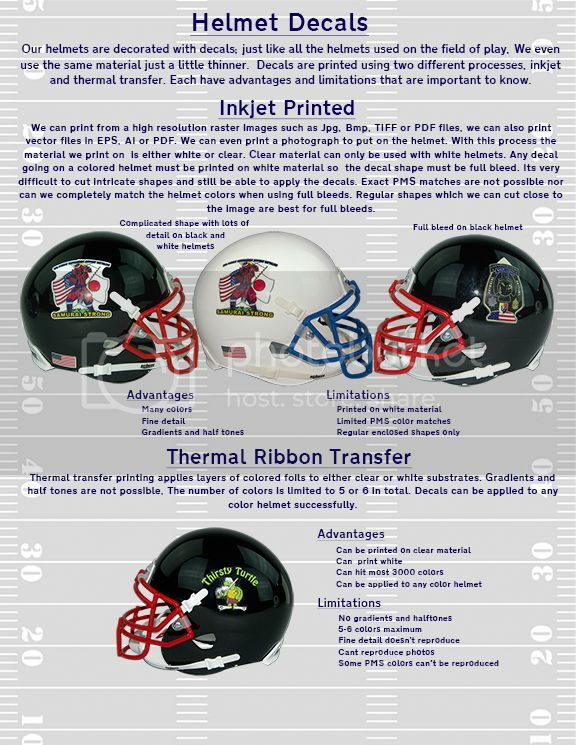 We have two methods for printing decals there are limitations to both. Premium glass display cases are decorated by laser engraving the inside of the front face before they are assembled. imprint area is all of the front face. Practically its best to keep any laser engraving to the bottom or top corners. These products are decorated using our UVPix 4CP+White direct UV print directly onto the product. For higher volume single color decoration we can Pad Print.